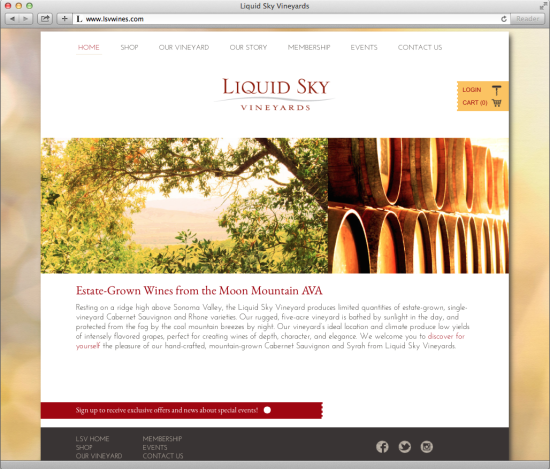 Prior to engaging 26 Brix, Liquid Sky Vineyards (LSV) relied on a website built on outdated web technology and e-commerce software, which had become an obstacle to ordering for LSV’s customers according to Dave Labuda, the winery’s owner. The ordering tool was difficult to use, had limited shipping functionality, and required customers to create a new account prior to purchasing. Labuda felt that the account-setup requirement discouraged consumers from ordering, and he wanted to remove this hurdle in the new site. The new website was completely redesigned from the ground up. It’s built on a custom WordPress theme with a seamless integration to VineSpring’s winery-specific e-commerce platform and MailChimp’s email marketing platform. It’s also mobile friendly with a completely responsive design. In addition to designing and developing the new website, 26 Brix also provided a set of recommendations for LSV’s marketing strategy, including social media recommendations and pricing strategy. The new website was the first step in implementing the marketing strategy developed by 26 Brix. Resting on a ridge high above Sonoma Valley, Liquid Sky Vineyard produces limited quantities of estate-grown, single-vineyard Cabernet Sauvignon and Rhone varieties. The vineyard’s ideal location and climate produce low yields of intensely flavored grapes, perfect for creating wines of depth, character, and elegance. Visit Liquid Sky Vineyards at lsvwines.com.